Remove Advanced Mac Cleaner rogue optimization tool from Mac OS X to stop its frustrating alerts and undo the concomitant bad effects it calls forth. Advanced Mac Cleaner usually appears on Mac boxes out of the blue and floods the victim’s experience with annoying warning messages. Also known as Mac Cleaner, it dupes the user into thinking that their machine has got numerous problems hindering normal performance. According to the fake alerts, the operating system’s productivity is impacted by junk files, duplicate objects, unneeded login items, crammed up cache, trash and logs, as well as rogue apps that are claimed to occupy excessive hard disk space and thus reduce the processing speed as well as responsiveness to commands. The number of these wrongfully reported items is flagrant, going over 1000 even on a well-tuned or new Mac computer. It’s not a commonplace distribution practice that’s leveraged by Advanced Mac Cleaner makers to promote their nasty brainchild. A great deal of infected users have caught this pseudo optimizer when installing free tools such as FileZilla or updating Adobe Flash Player via downloads from unofficial sources. In these cases, the setup wizard prompts you that an extra applet will be installed as a bonus to make the Mac run smoother. Some people are prudent enough to avoid such offers, which are generally known to deliver adware programs, but this caution doesn’t always help. Unless the bundle is manually unchecked and thus opted out of from the start, Advanced Mac Cleaner will still be installed in the background. Furthermore, the culprit may additionally cross-promote affiliated scareware like Mac Adware Cleaner by means of prompts on its GUI. To add insult to injury, it may hijack the victim’s default web browser and redirect their traffic to landing pages pushing its licensed version or a copy of another rogue system utility, such as Mac Tonic or Mac Auto Fixer. The malware is also known to propagate alongside browser redirect viruses and persistent adware apps that affect the victim’s web surfing experience. One of the notorious campaigns pushing the scareware in question relies on sketchy browser alerts that report alleged infection with a combo of 3 viruses called Tapsnake, CronDNS, and Dubfishicv. The victims are redirected to phony web pages that mimic AppleCare and insist on urgent download of Advanced Mac Cleaner to sort out the problem that isn’t there in the first place. It appears that the gang behind the rogue program in question is deploying a well-orchestrated malicious marketing campaign with a distinct flavor of social engineering. The user may be unaware of this forcible setup from the get-go, but not until a message like the one above pops up. It says that a huge number of issues have been found, specifying this information as follows “Issues may include duplicate files, system & internet junk, rogue software & recoverable drive space. Fix and enjoy a performance boost.” The ‘Start Repair’ button, if clicked, takes you to the junk application’s main interface that displays high improvement potential for each cluster of problems. Obviously, cleaning the purported bugs is a paid service. At that point, it’s reasonable to contemplate over what’s happening: you are being told to pay for rectifying issues that do not exist. It’s certainly the best move to get rid of the Advanced Mac Cleaner scam rather than follow the evildoers’ recommendations. 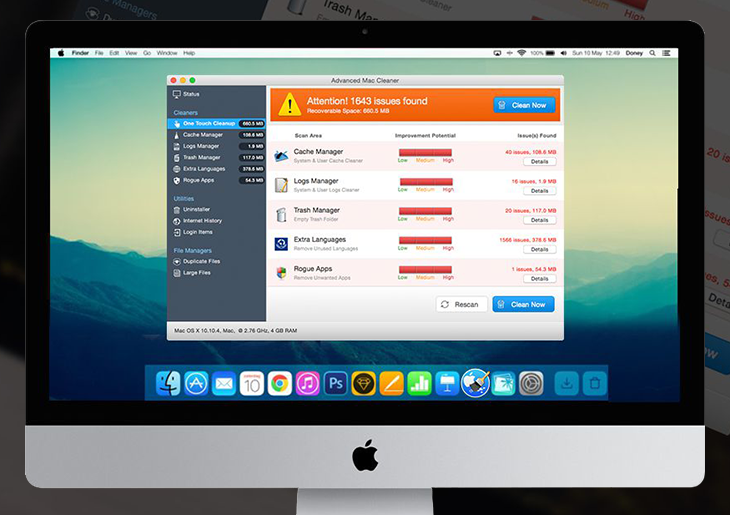 Proceed to the Uninstaller feature, find Advanced Mac Cleaner on the Applications list and have MacBooster completely eliminate all components of the app from your Mac by clicking Uninstall in the bottom part of the GUI. Doing so will ensure all components of the malware and its remainders, which may have not been removed in the manual way, will be thoroughly cleaned up.